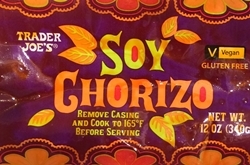 Terry and I had not thought much about chorizo until we saw soy chorizo mentioned in the Trader Joe’s Fearless Flyer. I found a recipe, we gave it a go, and we really loved the taste. I started collecting chorizo recipes. Recently I was going through my recipe database, and I realized that there was no one place for my chorizo recipes. I decided that needed to be remedied. I created a new cookbook chapter for chorizo in my database and added a new chorizo (search) type for recipes that contained chorizo, but where the primary ingredient called for the recipe to be in another chapter, for example, chicken. We had not had soy chorizo since moving here. There is not a Trader Joe’s nearby, but I figured that our local Sprouts market would have soy chorizo. I selected a recipe and went to Sprouts. I got the last package on that particular day. I made a chorizo and refried bean mix for soft tacos. Delicious! 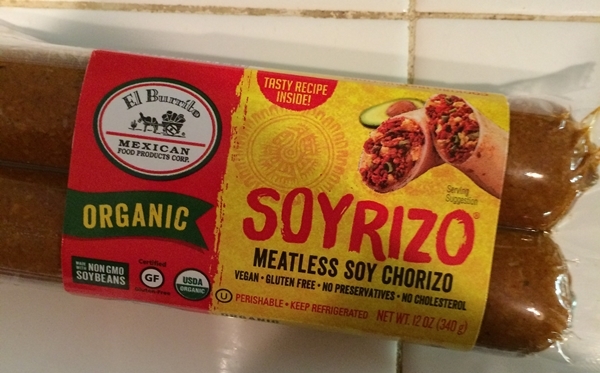 Given the shape of the packaging and the taste of the soy chorizo from Sprouts, I suspect that it came from the same factory that manufactures the Trader Joe’s brand. I’m happy to have soy chorizo back as part of our menu rotation.